SCVHistory.com LT4801 | Tataviam Culture | Tina Cooke, Charlotte Chacanaca & Susan Cooke at Balsz Ranch in Honby, Late 1940s. 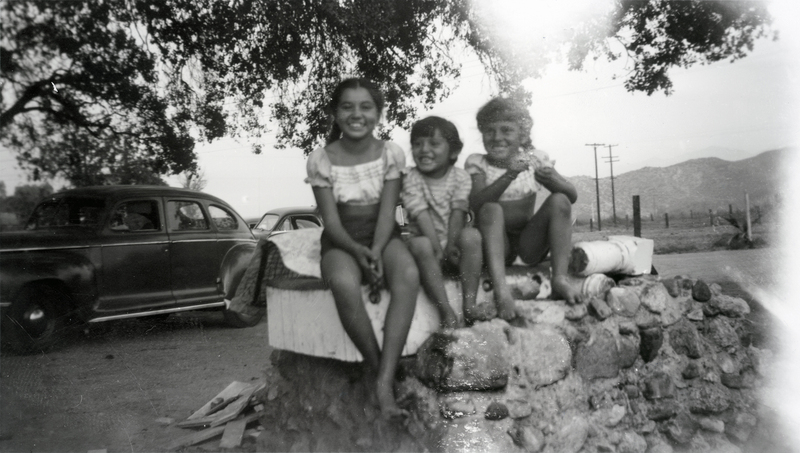 From left: Ernestine Agnes "Tina" Cooke, Charlotte Chacanaca and Susan Cooke at the Balsz ranch property in Honby, late 1940s. According to Tina, the photo is at the home of their cousin Irene Balsz. Tina (b. 1939) and Susan (b. 1945) were the eldest two (of three) daughters of Ernest "Ernie" Cooke (1919-1982) and Edna Louise Balsz. Through their father (Ernie), Tina and Susan trace their ancestry to individuals who lived in the Santa Clarita Valley prior to European contact in 1769. Charlotte is their first cousin on their mother's side. Charlotte is the daughter of Edna's sister Stella (nee Balsz) and Charles "Chuck" Chacanaca. Irene (not shown) is also their first cousin on their mother's side. Irene is one of three children of Edna's sister Elizabeth (nee Balsz) and Larry Madrid. All of the children's maternal grandparents are Bertolo "Bert" and Minnie Balsz. Bert (of German-Jewish and Chilean ancestry) and Minnie (Chiricahua Apache) came to Honby in the early 1930s and established an approx. 10-acre ranch bounded by Furnivall Avenue on the west, Honby Avenue on the east, Santa Clara Street on the north and Soledad Canyon Road on the south. They raised either eight or nine children there and conducted subsistence farming on the property, which was ultimately left to their children and sectioned off. The Chacanacas (commonly pronounced CHACK-a-nack, where "chack" and "nack" rhyme with "sack," not "sock") are believed to be at least partially native American, but we don't know their heritage. LT4801: 9600 dpi jpeg from original 3½x5½-inch photographic print courtesy of Tina Cooke.